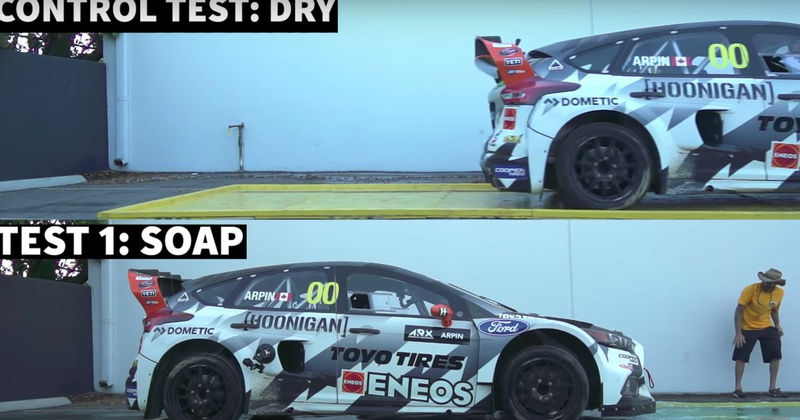 What Happens If You Launch A 600bhp Rallycross Car On Dish Soap? Fresh from seeing if you can do burnouts using plywood wheels, the guys from Scumbag Labs (think of the series as a more ‘Murican Garage 54) thought they’d try losing traction in very different way. Specifically, using washing-up liquid. The team dumped a whole load of the stuff in a specially-made platform, on which was parked a 600bhp Ford Focus rallycross car. Hardly a car wanting for traction. But in this situation, how might the car react while performing a hard launch? Would it still hook up? Could it be kept spinning long enough to get into sixth gear? Give the video a watch to find out.